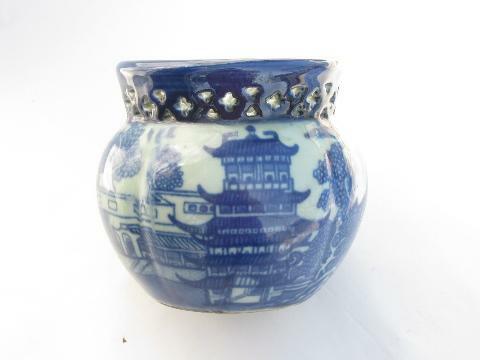 Beautiful England made delft ware flower pot or cachepot, ironstone china with blue willow inspired design. 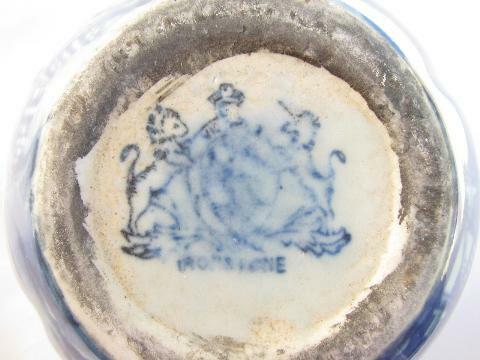 This is marked with the Royal Arms (lion and unicorn) English potter's mark on the bottom. The Chinese style designs of English delftware encompassed much of the 18th and 19th centuries, and we believe this piece probably dates to the later end of that time, late 1800s vintage. The pot has a pierced border, and measures 4" tall overall. There are some soil marks, but no chips or cracks to this piece.